BLUE RIDGE, Ga. – Secretary of State of the U.S. State of Georgia and Republican Governor hopeful Brian Kemp accused the Lieutenant Governor of Georgia Casey Cagle of a political stunt and pandering for endorsements. As the the Georgia Gubernatorial race heats up so do the accusations and claims of who really represents the people and who is running a self-serving campaign. One such accusation came earlier this week as Kemp sent an email to top NRA lobbyist Christopher Cox telling Cox that the NRA has been “Casey Cagled”. A mere two days later, a state Senate committee removed the jet fuel perk from the broad tax bill, and on March 1, the Senate passed a tax bill, with a 44-10 vote that still eliminated this jet fuel tax break. Recent legislation passed by both the House and the Senate of Georgia paint a different picture of Cagle’s true stance, according to Kemp. As promised by Cagle, this bill does not include the jet fuel tax break that Delta Airlines had hoped to recieve, but it does include a tax break of another kind that could greatly benefit the airline company. Kemp claims the new legislation grants airlines at Hartsfield-Jackson Atlanta International Airport an exemption from a local transportation sales tax, known as Transportation Special Purpose Local Option Sales Tax (TSPLOST). 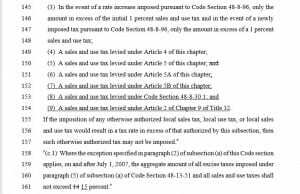 Section of HB930 describing exemptions for airlines. “As those of us involved in Georgia politics like to say…..you’ve been “Casey Cagled”. He tells you one thing while cutting secret deals to help Delta down the line,” Kemp stated of his opponent. 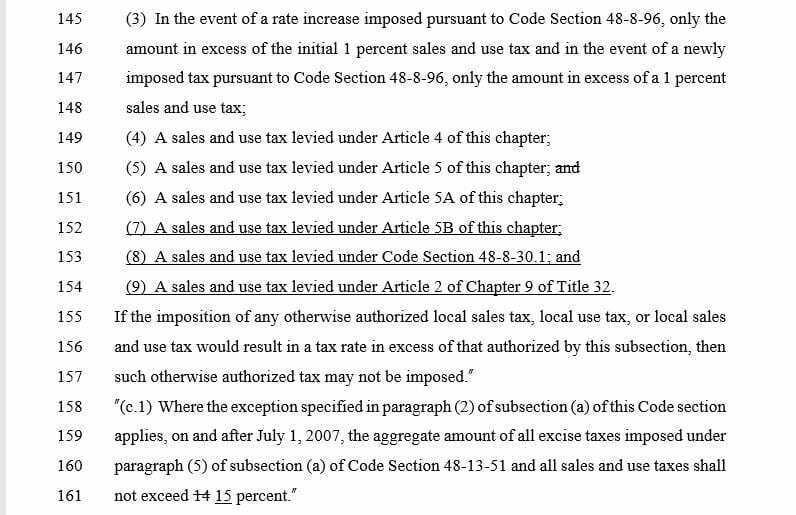 The Cagle campaign says that the legislation only extends exemptions for sales tax on jet fuels if Cobb and Gwinnett counties were to raise sales tax to join MARTA. According to Cagle’s campaign this in no way affects the Delta Hub located in Clayton County. FetchYourNews is talking with the NRA to gather their opion of the email sent by Kemp and their stance on the recently passed Georgia HB930. As you know, I am a Republican candidate for Governor of Georgia. My opponent Casey Cagle made quite a spectacle trashing Delta Airlines this legislative session trying to show he is a strong supporter of the NRA. I’m quite sure he has been pushing for, if not demanding, your endorsement now that the session is done. That sounds real good. But there’s one big problem with it. The NRA is getting played. Please have your team review HB930 from this past legislative session. It passed on the last day (aka Sine Die). It is a legislative package to expand mass transit in Georgia, especially in the metro Atlanta area in which Hartsfield-Jackson Airport is located. This legislation does not include the comprehensive jet fuel tax break that Delta Airlines sought earlier in the year, but it does grant to airlines at Hartsfield (notably Delta) an exemption from a local transportation sales tax known as TSPLOST that Clayton County may levy in the near future. Clayton County is where Hartsfield Jackson airport is primarily located. The exemption applies to any airport that has more than 750,000 takeoffs and landings per year. In Georgia, the only airport that qualifies is Hartsfield Jackson. As those of us involved in Georgia politics like to say…..you’ve been “Casey Cagled”. He tells you one thing while cutting secret deals to help Delta down the line. I know that Cagle’s team will throw all sorts of confusing jargon and legislative baloney at you trying to deny this. It’s complicated legislation that they will undoubtedly try to make more complicated when they explain it to you. But the facts are the facts. Delta benefits in the near future from this legislation that Cagle supported. Chris, I have been a member of the NRA for many years. I hunt, fish, and carry. I have served in the State Senate and have a rock solid voting record on 2nd Amendment issues. Most importantly, I will tell you where I stand and I don’t waver. I do what I say in everything that I do. In stark contrast, the record of what you get with Casey Cagle is crystal clear. If you are interested in having someone in this important office who believes as you do and will not play these kind of games, I welcome your support and ask for your endorsement.